Who is writing that blog? Gender Analyzer is a cool online tool to determine whether the site is written by man or woman. 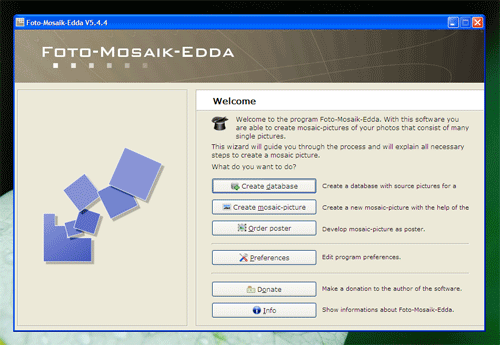 Foto-Mosaik-Edda is a free software for creating stunning, impressive mosaics photos. To use Foto-Mosaik-Edda, you need lot of source images (the bigger the better, the more the better) , as they recommended is 2000 or more, to create a mosaic database. When you first create mosaic database, it takes time because it scans through your photos and create a base set of “titles” for your mosiac. Once you have done create a mosaic set, creating mosaic photo is straight forward. Just pick up a photo and generate. The software is available for Windows only. In order to capture the whole web page, I used Browsershots and Super screenshot before. Both of these tools are doing well except Browsershot has many features than Super screenshot. Now there is a new tool called Aviary Screen Capture allows you to capture the whole web page and let you edit on the fly. Aviary not only offers capturing web page capability but also let you edit, put text annotation, pencil brush, arrow and other tools as well. And you can save it into your desktop or host images online. If you’re using Firefox, it has Firefox extension as well as bookmarklets. For instance, you can use http://aviary.com/myokyawhtun.com where (myokyawhtun.com is the url you want to capture). 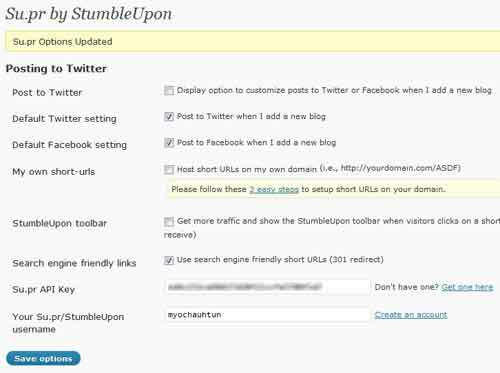 Su.pr is a new URL shortening service developed by Stumbleupon that allows you to post your Blog post and message Twitter and Facebook via your WordPress. 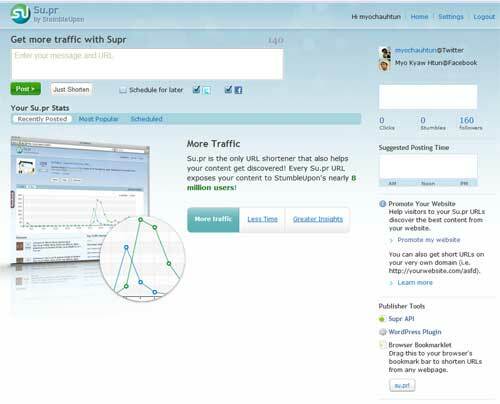 Su.pr has a feature that update automatically to Twitter and Facebook whenever you publish new blog post. Su.pr has customization options allow you to customize posting to Twitter or use the default setting. If you check on the first option “Post to Twitter”, you will see extra option in New/Edit post page. Another great feature from Su.pr is that you can use url shortening with your own domain name. (example: http://yourdomain.com/abxr instead of http://su.pr/abxr). Currently Su.pr is in invite beta but you can sign up by using invite code “suprbeta”. API key is required to use for your wordpress plugin. You can find API key in setting page.